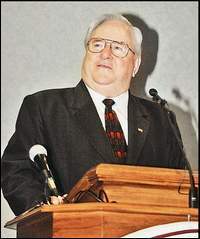 According to an article on Express Gay News, the Reverend Jerry Falwell (pictured left), founder of the Moral Majority and Liberty University, has endorsed the forcing of gay teenagers into “reparative therapy” at centers such as Refuge in Memphis, Tennessee. The Refuge center is run by Love in Action, an affiliate of Exodus International, an organization that bills itself as the largest ex-gay organization in the country. At the 2005 Exodus International conference, which is currently going on at the Lifeway Ridgecrest Conference Center (run by the Southern Baptist Convention) near Asheville, North Carolina, Falwell compared letting children identify as “gay” to allowing children to play on the interstate. This year’s “Freedom Conference” was attended by more than 1000 and took on a higher profile after the controversy surrounding Love in Action and the experiences of Zach Stark (pictured right), a gay 16 year old Bartlett, Tennessee, boy who blogged about his parents forcing him to be sent to the camp and “turn” straight (see earlier post Gay teen to be released soon from Tennessee ex-gay camp). There has been no more news regarding the release of Zach Stark and no new information is available regarding the affect which the ex-gay camp might have had on him. Falwell has gone and done it again. After opening his big, fat mouth after September 11th, blaming the tragic events on gays, feminists and the ACLU, Falwell is going about his old tricks again. Who should know better about therapy and forced therapy upon youth: The Reverend Bigot Falwell or the American Psychological Association? Also, who knows better about sexual orietnation and the science surrounding it? Just because some people may believe homosexuality is choice does not make it true. The Church once insisted that the earth was the center of the universe, despite science’s claims to the contrary. I wonder when the Church will have to apologize for the actions of bigoted leaders like Falwell in the future just like it has apologized for the actions of the leaders in Galileo’s day? Wake up and smell the coffee!!! While you’re at it, start treating ALL of God’s beautiful children equally and fairly.